One of the many tasks facing the empires once they had established contact with each other was to set a universal time. Each of the empires naturally had their own calendar and clock, based more or less on the length of the day and year on their respective home planets. This made up for some serious confusion and it soon became apparent that some sort of a synchronized time keeping was needed so inter-racial communications could run smoothly. Of course, basing this universal time on the calendar of one of the empires was out of the question, the other would never agree to it. So a new one had to be devised. The debates on the new calendar and clock soon boiled down to arguments between three main groups, the Arithmetics, the Traditionalists and the 25ers. The debate was initially conducted between scholars, which then put forth proposals for the politicians and the public to consider. The three main groups each drew their support from different fields of science and academics. The Arithmetics were mainly physicists and engineers, the Traditionalists were mostly historians and archeologists and the 25ers group consisted of biologists and sociologists. The Arithmetics wanted the new calendar and clock to have nothing whatsoever to do with old planetary-based calendars, instead they wanted to base it entirely on mathematics. They claimed that the physics-oriented nature of the modern world demanded this. The Traditionalists said the only way to go was to base the new calendar as much as possible on the 24-hour, 365-day calendar favored by early post-collapse settlers. All the races, especially the Jovians and the Amarrians, had some data on the old calendar and by combining the data it could be remade more or less in its original form. Finally, the 25ers claimed that the only measurement worth considering in a space-faring age was that of the human body. The internal body clock of humans is close to 25 hours, and thus they wanted to base the new clock on that measurement. During the long and arduous discussions numerous factions rose, declaring themselves champions of one cause or another. One of them, identifying themselves with the 25ers, was a small Gallentean grass-root organization led by an energetic young man by the name of Cerb Rausolle, although he preferred the pseudonym the Astrologer. Through the efforts of the Astrologer the 25ers gained great public support, spurred on by the surprisingly big network put into place by the Astrologer. Instead of going the public way as the 25ers the Traditionalists had focused on the politicians, correctly as it turned out to be as it was they that had the final saying. When the final decision was made aboard the Jovian cruiser Yoiul the Traditionalists won comfortably. A day would be divided into 24 hours and the year 365 days with an additional day every 4 years, the same as the calendar of the early settlers. The date was set as 0 YC. The Yoiul Conference was held 111 years ago, so the current year is 111 YC. The Astrologer was not to let his large organization network go to waste and soon found a new cause worthy of his attention. At that time space ship owners were required to pay huge amounts of money each year for their ship license. This was something that all the empires enforced as it provided a good deal of income for them, plus it meant that only the cream of the society could afford to be in space business. But this of course also hampered space trade and made it difficult for the average Joe to get into the business. The Astrologer and his organization (still called the 25ers) started lobbying for a change in the legislation. Since CONCORD was responsible for issuing ship licenses and collecting the license fees, it became the target of the demonstrations organized by the 25ers. At first CONCORD ignored the protests, but as they became more serious it began taking notice. As it had been recently formed, CONCORD was concerned about the image it was projecting to the public and a committee was formed to handle the matter. As is often the case, things dragged on for months. All the while the Astrologer was planning more and more outrageous acts of protest, even going so far as to organize general strikes on some planets. The icing on the cake came during the first New Year celebration, celebrating 1 YC, at the headquarters of CONCORD. 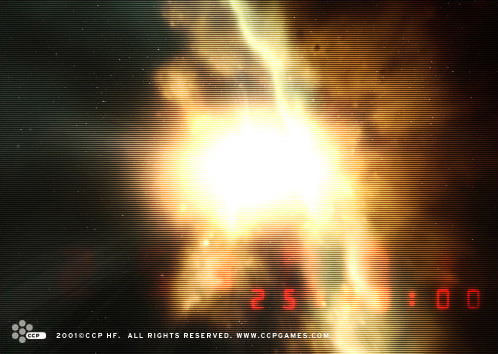 The Astrologer then managed to infiltrate the station’s defense perimeter with a lone, unmanned cargo ship filled with explosives, which he then promptly detonated outside the station in plain view of many of New Eden’s most prominent people. The Astrologer was careful not to blow the ship up so close as to injure any of the guests, but his message was heard loud and clear. Two months later new CONCORD legislation abolishing the license fees was passed by all the member states. The Astrologer, now a fugitive after his stunt, quickly became a living legend. The 25ers organization was dismantled and the Astrologer lost his status as the champion of the people. But his name is not forgotten, nor that of the 25ers, and every now and then a new group is formed somewhere in the world of New Eden, proclaiming itself as the successor of the old 25ers, dreaming of reliving the times when the little men defeated the big guns.